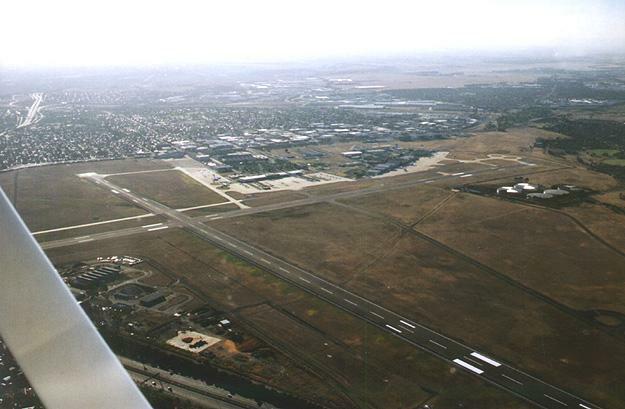 This photograph of Melbourne's Essendon Airport was taken on 14 March 2004 from almost above the Runway 26 threshold, looking west north-west. The remains of the diagonal Runway 04/22 can just be made out - refer to a 1960 aerodrome diagram. On the southern apron, two ex-Ansett Airlines BAe 146s can just be made out, parked in storage. At the northern end of the field can be seen the line of the original hangars along what used to be the Bulla Road. The proximity of the built-up area to the west can be clearly seen, and the green patch in the upper right of the photo marks the location of Melbourne/Tullamarine Airport.